Richard B. Richardson, Jr. of Houston blew away a 1988 state record when he caught a 972.72-pound blue marlin from the Gulf of Mexico off Port Aransas. The huge fish measured 132.25 inches. Richardson was fishing in the Bastante John Uhr Memorial Billfish Tournament as a member of the eight-person Legacy Fishing Team. The previous state record weighed 876.5 pounds and was caught August 20, 1988 off the coast of South Padre Island. Texas Records Website click here Below is a list of big blues in the Gulf from Capt. John Cochran. 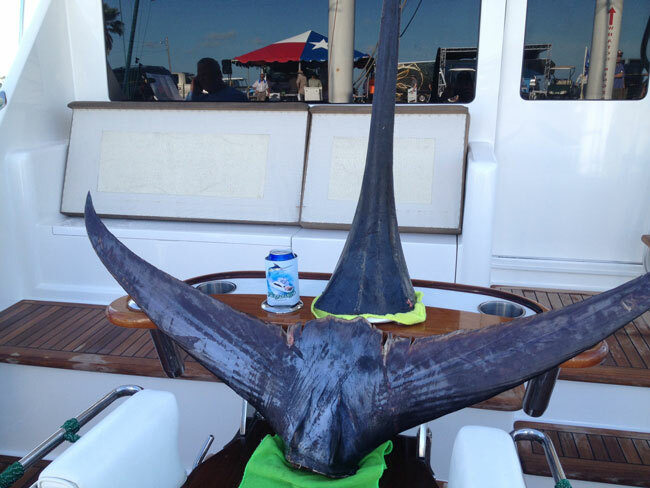 LARGEST BLUE MARLIN CAUGHT IN THE GULF OF MEXICO OVER 700 LBS. This is an unofficial list. I have compiled this information with my best intentions through limited research. If you have more information on these fish or a fish not listed weighing 700+ lbs. please contact me @ 409-739-4817. Any day you catch a Blue Marlin is a good day but when you catch a State Record Blue Marlin it is a once in a lifetime experience. I have been Marlin fishing for 46 years and Friday, July 11, 2014 is a day that I will never forget. I have fished on a 56’ Viking, “Legacy” owned by George Gartner, Captained by Kevin Deerman with Mate Cameron Plaag for the last 6 seasons fishing the Tournament Circuit here in Texas. We have an unbelievable crew of very seasoned veterans on our team with Colin Ocker, Ken Yarbrough, Jeff Owen, Michael Fitzpatrick and myself running the show in the cockpit. We use a variety of fishing methods, dredge dink fishing and lures but our absolute favorite especially in Tournaments is to live bait the deep water rigs. Our favorite bait is Tuna but we have used Rainbow Runners, Blue Runners and even Hardtails in a pinch when catching bait gets tough. We departed Port Aransas on Thursday evening, July 10th right after a viscous Thunderstorm with a heavy outgoing tide that made the ride out quite uncomfortable. We were fishing in the John Uhr Memorial Billfish Tournament, better known as the “Bastante” out of Rockport. We arrived at our destination the deepwater Spar Hoover/Diana around 5:00am and started catching our live bait. With our 4 Tuna tubes filled we put out a spread of 2 live baits, one in each rigger with our drop-backs. One bait was 150 feet back and the second one was 300 feet back, both swimming and digging hard against the clips. There was only one other boat there, the “Mine Time” another Viking and we were trading positions around the spar marking bait and dodging seaweed as best we could. We had caught the only weighed Blue Marlin, a 561.8lb fish in this tournament the previous year on the first day and were hoping for a repeat performance. At 6:55am it happened! The right rigger clip popped, the drop-back slowly started disappearing and the line started rolling off the spool. I slowly applied the drag to strike and we were tight but the fish didn’t do much, just rolling line off a couple of feet at a time. I turned to Colin and said “Í think it might be a Shark”. Colin replied “I have seen quite a few bites just like this that turned out to be Blue Marlin”. No sooner than he had uttered those prophetic words line started screaming off the reel and I got hooked up in the chair. Almost 200 yards of line dissolved into the cobalt Gulf of Mexico and the fish came up jumping off of our port side. We could see it was a good sized fish but that far out and no real reference point to judge it against we just estimated it would go over 500lbs. Kevin started backing down hard and we slowly began to retrieve some of our line back. The fish came up jumping again about 150 yards out and then started to dive on us. I knew if this fish got her head down on us we could be in for a long, grueling fight and our odds would be going down just like the line. I pushed the drag past the strike button and started to apply pressure with my left hand at the same time. After a couple of minutes of a standoff the angle started coming up and we started gaining line. We got within 30 yards but she was digging unbelievably hard right off the port side and the line was barely clearing the corner with the line pinging off the reel when she made her last run. I steadily cranked and we only had about 50 yards out when she came up jumping for the third time straight away from the boat and everyone got a good look at the length and the girth. I yelled “it’s a Pig” and the foam coverings came off the gaff heads, the meat hook came out and everyone was instantly in full on attack mode. Steadily gaining line she came up 25 yards out trying to clear the water but when she was only able to get about half of her body out of the water I knew she was getting tired. Kevin put the pedal to the metal to give Cameron a shot at the wire and after a few more cranks of the handle we had leader in hand. The fish cut back and forth across the transom giving “Camo” some curry on the wire as they say in Australia but he put all of his 150lbs into it and Colin sank the first gaff and Jeff sank the second. That was when the party started! It took less than 20 minutes to get her to the boat and about another 40 minutes to get her into the boat. We opened the transom door and tried to slide her in but she was having none of that. We stuck the meathook in her lower jaw, took a couple half-hitches around her bill and held on for dear life. She was headshaking so hard that the video they were shooting on the bridge was shaking in rhythem with each whack of her bill on the deck. Finally after some convincing with the bat she finally settled down where we could try to put her on the deck. It took six full grown adult males to get her in the cockpit after much swearing and grunting. We taped the length down the body and it came out to 137 ½ inches with a 74 inch girth. This fish completely filled the cockpit with the tail laying up against one side of the hull and only inches from the other side. George was shooting video from the bridge and he asked me what I thought about the weight and I said “this is a new state record”. From start to finish, hookup to in the boat was exactly one hour. We immediately started the 4 hour run in to the weigh station and George made a call on the satellite phone to Tami Noling, Tournament Director to let her know we were coming to weigh a fish. By the time we pulled into the weigh station in Rockport the crowd was buzzing with anticipation, the “Coconut Telegraph” had been lighting up social media of all kinds. It took all available hands at the weigh station to get the fish out of the boat and hoisted onto the scales where Tournament Weigh-master Ernest “Bud” Kittle finally called out the official weight 972.7lbs, besting the 26 year old record by almost 100lbs. 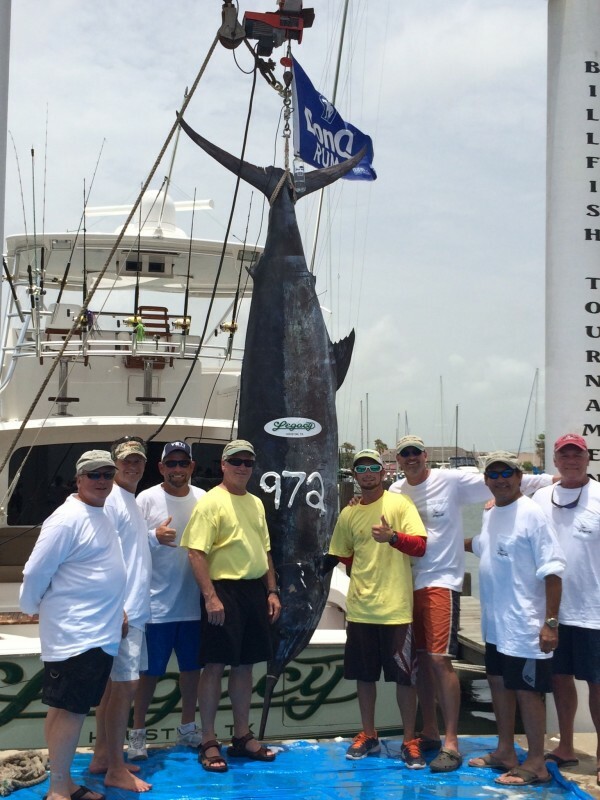 It was now official, a new Texas State Record Blue Marlin. A great boat, a great crew and a great opportunity came together that day to produce something that happens once in a lifetime.